Esquire Network is hitting the field again. Recently, the network has announced the new season of their docu-series Friday Night Tykes will premiere on January 19th. The series focuses on the competitive world of youth football in Texas. Season three will see the series pick up with all-stars of the San Antonion Outlaws team as they play against top teams from California, Colorado, and other parts of Texas. 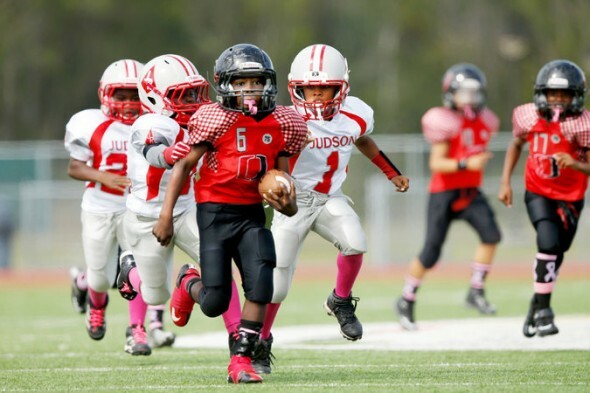 LOS ANGELES – December 16, 2015 – After two explosive seasons, Esquire Network’s hit documentary series FRIDAY NIGHT TYKES returns to San Antonio, TX for a third season on Tuesday, January 19 at 9/8c. The series that sparked a national debate will continue the conversation with 10 episodes ordered following one of the most competitive youth football leagues in America. With exclusive access to the 10 and 11-year-old division of the Texas Youth Football Association (TYFA), viewers get an authentic look at the making of football’s next generation of professional superstars as the series digs deep into controversial hot topics that are prevalent in today’s media. With no size or weight limit for its players, TYFA, an independent youth football league places children in the center of the firestorm. FRIDAY NIGHT TYKES addresses serious questions about youth sports and specifically as they relate to parenting and safety. How hard should we truly push our kids? Is the pressure too much for a child? What do we hope to achieve? Is this sport safe for young children? The groundbreaking series doesn’t shy away from tackling the controversial questions at the heart of every All-American football family. Parents and coaches share insight into why they believe the sport is important, what motivates them, and what lessons they feel that the children learn from their discipline and dedication. As many of the player’s followed in previous seasons enter their final year in TYFA, viewers see an unbelievable phenomenon arise as teams compete to recruit the league’s top players, with some parents claiming they’ve been offered incentives to join different teams. This creates a veritable free agency market for 11-year-olds. Last season, viewers saw the initiation of newly designed programs to improve safety and conduct while attempting to maintain the league’s reputation as the most competitive youth football league in the country. After the Bronco’s coach Charles Chavarria was suspended for encouraging improper tackling techniques, his former team attempted a gentler approach that resulted in less wins for the season. The football fanatical Hurt family parted ways with the Lobos after accusations of favoritism led to a nasty incident on the sidelines. Tempers flared and a verbal altercation ensued. Coach Marecus Goodloe led the Colts to a turbulent and emotional season before stepping down as Head Coach. Meanwhile his good friend, Fred Davis continued to lead TYFA’s pre-eminent franchise, The Outlaws, to an undefeated season and a second consecutive championship title. Now, a new season kicks off with all-star tykes dominating the Jr. division and Goodloe and Davis joining forces and taking the San Antonio Outlaws national to join the Snoop Youth Football League (SYFL). Raising the bar, this places the Outlaws in direct competition with select youth teams from Texas, California and Colorado, with a chance at winning the National Title. These seasoned young athletes embody the intense passion of Texas football where everyone lives and breathes the sport. And while their focus is on wins over losses, an underlying question presented in the series is if there is a better way to define victory. What do you think? Do you watch Friday Night Tykes? Will you watch the new season? More about: Esquire Network TV shows: canceled or renewed, Friday Night Tykes, Friday Night Tykes: canceled or renewed?